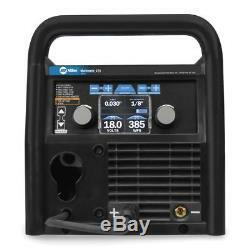 Miller Multimatic 215 Multiprocess Welder with TIG Kit 951674. 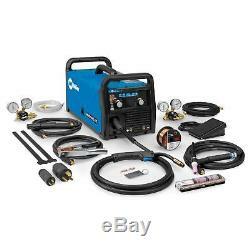 Easy-to-use and versatile MIG, Stick and TIG welder that helps build skills. Color screen featuring Auto-Set Elite. 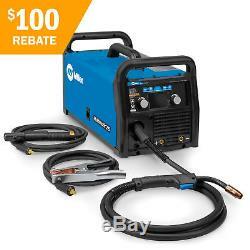 This all-in-one welder connects to 120 or 240 volt input power. Welds up to 3/8 mild steel. 6.5 ft (2 m) power cord and MVP adapter plugs for 120V and 240V. 10 ft (3 m) M-100 MIG gun and cable assembly. 13 ft (4 m) cable electrode holder and 25 mm Dinse-style connector. 10 ft (3 m) work cable with clamp and 25 mm Dinse-style connector. Argon and AR/CO2 mix regulator/flow gauge with hose. 030 in (0.8 mm) solid wire. 030 in (0.8 mm) wire. Quick Select drive roll for. 024 in (0.6 mm) or. 035 in (0.8/0.9 mm) solid wire, and. 035 (0.8/0.9 mm) flux cored wire. TIG Kit for the Multimatic 215. MIG, flux-cored, DC stick and DC TIG processes, allowing you to build your skills. Color LCD with Auto-Set Elite. Auto-Set Elite can be used on multiple materials and multiple processes with the ability to fine-tune your settings. Simple to set up and use! 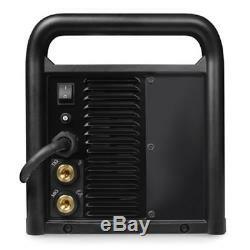 Inverter technology combines best-in-class arc characteristics with the portability of a 38-pound machine. The arc is extremely forgiving to variations in arc length and travel speeds. There are two gas connections on the back of the machineone for MIG and one for TIG. Auto Spool Gun Detect automatically detects when a MIG gun or spool gun is connected eliminating the need for a switch. The Spoolmate 100 and Spoolmate 150 are compatible with the Multimatic 215. Multi-voltage plug (MVP) allows connection to common 120 or 240 V power receptacles without the use of any tools simply choose the plug that fits the receptacle and connect to the power cord. Angled Drive System with Quick Select Drive Roll. Robust, angled wire drive with Quick Select drive roll. The Quick Select drive roll offers three grooves- two for different size solid wire and a third for flux-cored wire. Smooth-Start provides smooth, spatter-free MIG starts. Fan-On-Demand power source cooling system operates only when needed, reducing noise, energy use and the amount of contaminants pulled though the machine. Spool gun for aluminum welding. Please request a quote for other locations. Racing / Customizing / Restoring. 1.5 m/min - 15.2 m/min. 60 IPM - 600 IPM. Running Gear / Cart (Optional). We are open M-F 8-4 Eastern. We get it to your door. Warranties may not be honored in all countries. All payments in US dollars. Thanks for your interest in Netwelder. In business since 1968, our mission is to provide the best welding equipment and supplies at an affordable price. We will be adding extra features and new products often, so come back regularly. Be the First to Know. Get all the latest information on Events Sales and Offers. Sign up for newsletter today. The item "Miller Multimatic 215 Multiprocess Welder with TIG Kit 951674" is in sale since Wednesday, June 28, 2017. This item is in the category "Business & Industrial\Manufacturing & Metalworking\Welding & Soldering\Welding\Welders, Cutters & Torches\TIG Welders". 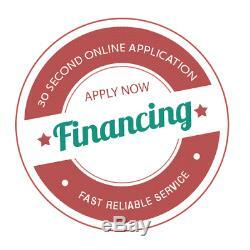 The seller is "netwelder" and is located in Indianapolis, Indiana. This item can be shipped worldwide.